I’ve even heard it’s a pretty important game, a real big deal. One of those “Bowl” football games. Oh, and the New England Patriots are playing. Cool! I am happy to report, Stefanie and Dan are still happily married. I’m not sure what Dan’s plans are for this weekend, but I do know what Stefanie is doing. The officiant in this clip is actually the bride’s aunt, Carol Merletti, of Wedding of Your Desire. Carol is a Massachusetts Justice of the Peace who has been performing weddings since being appointed in 2004. She doesn’t just perform ceremonies concerning the Patriots. Out of over 650 weddings, Carol has performed 22 wedding ceremonies at Fenway Park. I also don’t mind sharing a wonderful fact about Carol, she performs ceremonies for any active duty military personnel at no charge. Be sure to share this post with your favorite Patriots fan (or a Giants fan who you don’t really care for). And click “like” if you’re rooting for the Patriots. I am sure you will agree, Stefanie really captures the true spirit of the upcoming game! The studio for Photo and Video by Joe Goldsberry is an official drop off location for Cell Phones for Soldiers. If you have no idea what Cell Phones for Soldiers is all about, I am here to fill you in with the facts! Cell Phones for Soldiers was founded by two teenagers from Norwell, Mass. Siblings Robbie and Brittany Bergquist, at the ages of 12 and 13, decided they wanted to show their family’s appreciation for the men and women who have sacrificed the day-to-day contact with their own families to serve in the U.S. armed forces. Started in 2004, they have raised over 7 million dollars in donations, having collected over 8.3 million cellular devices. You can drop off your old, discarded, and even broken cell phones at any official drop off (including Photo and Video by Joe Goldsberry’s studio at 29 Church Ave., Whitman). Cell Phones for Soldiers sends the old phones for recycling and uses the money from that to purchase calling cards, which are then sent to soldiers overseas, so they can call home to their loved ones without adding a financial burden to an already stressful time. Every $5 raised provides 2.5 hours of talk time. You can also request talk time to be sent to a soldier you know overseas. Cell Phones for Soldiers is a program that Photo and Video by Joe Goldsberry is happy to support, and we hope that you will consider supporting them, too. Give us a call at 774-240-1152 if you want to drop off some old cell phones. We have already collected and sent off approximately 200 cell phones since we became an official drop off location. Visit Cell Phones for Soldiers blog, and read about how such a small act on your part can make such a big difference in the life of a soldier. 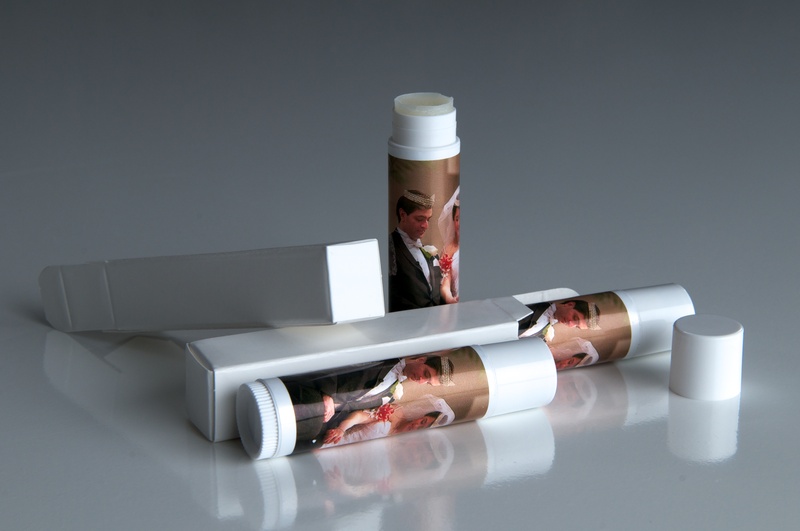 When you’ve been in the wedding business as long as we have, you’ve seen every wedding favor known to mankind. Some are, oh let’s say interesting. Some are cool, awesome, kitschy, unique, useful, sui generis… and some (many) just get left behind. Let’s face it, there are only so many ways you can display Jordan Almonds in a fashion that prompts people take them home. I love supporting another small business, and Heather at Kustom Kissers fits the bill of small business extraordinaire, even from clear across the country from us (she is located in Arizona). One of our more colorful photos gracing a Kustom Kisser. 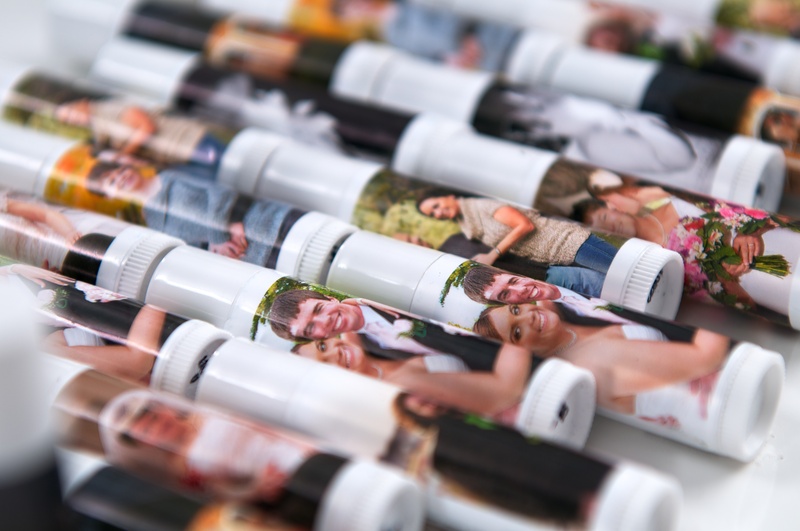 Stephanie and Dan's photo, proving black and white works just as well as color on these lip balms. She had no idea just how important that question is, and you, the reader, have no idea how often a prospective client asks us that. Almost never. Liability insurance is, in our opinion, a cost of doing business. It is not required. But carrying it says how serious we are about Photo and Video by Joe Goldsberry. This is our full-time business, full-time job, and our bread and butter. We can not imagine skimping on something as important as liability insurance. Sure, we hope we never need it. But come the day that we do need it, our client will be oh so elated that they choose to hire a company for their wedding that cared enough to treat their business like a, well, like a real business. The company we happen to use, R.F. D’Agostino Insurance, helped us come up with a policy that covers what insurance was meant to cover – the unexpected. We are taking tens of thousands of dollars worth of equipment from our studio to various churches, venues and reception halls. Depending on the job, we could have cords, electrical components, cameras unattended on tripods and many other situations which could lead to liability on our part. As careful as we are, (knock on wood), we don’t own a crystal ball, and we can’t predict the future. We welcome questions during client meetings about our liability insurance, our coverage, and the company we use. We can produce a certificate for any venue that requires vendors to carry their own insurance. We wish more people would ask about it, and we want to get the word out about just how important this aspect of choosing your vendors is. This is truly something that sets apart the serious, full-time photographers and videographers who care about their company from the weekend warriors who charge a cut-rate price for a mediocre product. It even sets us apart from other full-time companies who just don’t care enough to protect themselves and their clients. Oh, and we can even keep this post more “wedding friendly” than you think. After Mark D’Agostino became our insurance agent, he and his fiance, Meredith, became our clients! Mark D’Agostino, our insurance agent, with his beautiful bride, Meredith. After he became out insurance agent, they became our clients. After over 30 years in the wedding industry, we’re seeing a new trend starting to emerge. The weekday wedding. And we say… “Why not? !” There are seven days in the week, and where is it written that you can only celebrate your wedding day on three of those days? When Nir and Yamit first came to us looking for a wedding photographer, they hadn’t even decided on a venue yet. The one thing they knew for sure was they would be married on a Tuesday. A weekday wedding made it easier for family and friends who were not local to attend. This would be out first Tuesday wedding, and another first for us – we were able to recommend the venue to the couple (usually the first thing a couple books). And so it was set, the ceremony and reception to take place at The Easton Country Club. We were also able to recommend a great videographer for the couple, Cupid Productions, via our special photo/video package. 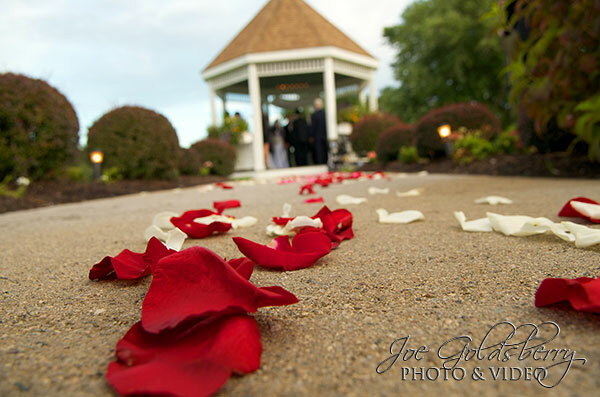 A great view of the flower petals leading up to the ceremony, which was held in the gazebo. Just as beautiful and as formal as any other day of the week, Nir and Yamit look fabulous for some pre-ceremony photos. The reception went on, full swing, until 11:00, and we can attest to the fact that a good time was had by all. Hello and welcome! If you are taking the time to read this, you have found the brand spanking new blog for Photo & Video by Joe Goldsberry, and we want to thank you for stopping by and taking a peek. Photo & Video by Joe Goldsberry is a small business with a studio/store front in downtown Whitman, Mass. You may have heard of Whitman- it’s where the Toll House cookie was invented (what we now call the chocolate chip cookie). 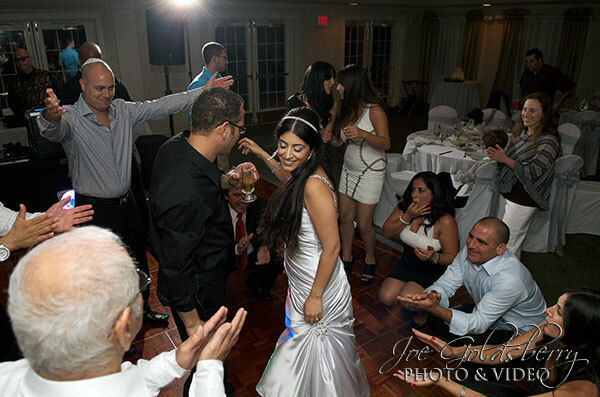 With this blog, we plan to keep our readers entertained and educated with our beautiful photography, our engaging videos, and posts about the photo, video and wedding industry. We’ll be writing about topics that you didn’t even think to ask about (but you’ll be glad we did!) and we’ll invite guest bloggers to come on from time to time. We’ll introduce you to other local (and sometimes not so local) small businesses, people we do business with and have come to trust. A little bit about us. Photo & Video by Joe Goldsberry is owned by Joe Goldsberry (as you could imagine). We are a small company who takes customer service very seriously. We strive to treat every client as we would expect to be treated, and we also endeavor to help educate our clients, so they receive the best service and the best end product possible. Our studio/store front is located at 29 Church St. in Whitman. We keep regular posted business hours, but being a small business, we also see clients during off hours by appointment, when requested. We provide professional photography and videography for weddings and other events, as well as studio and on location portraits and corporate services. We also provide a tape to DVD service in-house which is currently seeing a boom, as people are finding all their old home movies, dance recitals and their own wedding on tapes that they can no longer watch. We are also a full-time business, which is a great asset to our clients. Joe is assisted by his wife, Denise, in day-to-day operations as well as marketing and customer service. We hope you will enjoy the photos, videos and posts that will follow, and share our blog with your families and friends. We welcome your input and questions, and look forward to a great blogging experience.